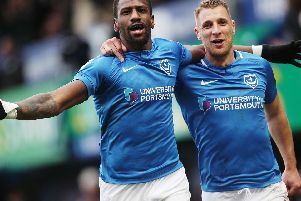 Gary Roberts spoke of his Pompey pride after a magnificent Portman Road showing. Paul Cook’s men came within two minutes of knocking Championship side Ipswich out of the FA Cup. Substitute Conor Chaplin’s 86th-minute finish had the Blues dreaming of a 2-1 victory in Saturday’s third-round fixture. Yet Ryan Fraser’s 88th-minute free-kick leveller secured a replay for Mick McCarthy’s team. Regardless, it was an outstanding display from the visitors, who outplayed their hosts for long periods. Disappointment then for skipper Roberts on the return to his former club. But he remained delighted with the desire and determination displayed by the League Two team. Roberts said: ‘We got a draw at the end of the day but I think performance-wise we did ourselves justice. ‘We knew we could hurt them with the way they play and how we set up with the man in the hole. I know they got the goal at the end but it shows how far we have come. ‘We are proud of ourselves. ‘Personally I felt we were on top and controlled the game, which is what we try to do that wherever we go. With our manager you are not going to go to Ipswich and put everyone behind the ball. ‘When Conor scored I thought we would have got another one because it would be obvious they would push on. ‘As it was, the referee was too quick to whistle for the free-kick which led to the equaliser. ‘But Ipswich are a top Championship side and we have given them a right game. ‘I think we shaded the match and probably deserved to win. ‘It was nice being on a big, open pitch against a team which wants to beat you as well. In League Two it’s a battle but on Saturday we could express ourselves and did ourselves proud. ‘Considering the level of our performance we are gutted not to have won the game, but have come a long way. ‘We’ve only been together for six months and done alright against three Championship sides this season. ‘So why not beat them at Fratton Park? Ipswich were booed off at the break after struggling against the visitors, yet took the lead through Tommy Oar in the 53rd minute. Two minutes later, Kyle Bennett’s maiden FA Cup goal made it 1-1. It was also the winger’s first since scoring on his Pompey debut in the season opener. And Roberts was delighted to see his team-mate net. He said: ‘It’s nice to see Benno on the scoresheet because he puts so much work in and is normally assisting people. It was a great goal too.